I've seen others post about having issues because of QT5, but haven't seen how anyone was actually able to fix it. I cannot install Synergy on Linux Mint because of the missing "qml-module-qtquick" items. I've tried looking at the dependencies & trying to work backwards, but not having much luck with that rabbit hole. I've seen a few other Linux Mint posters, but the problem seemed to mainly be associated with older Ubuntu versions. May have found the source of my problems... 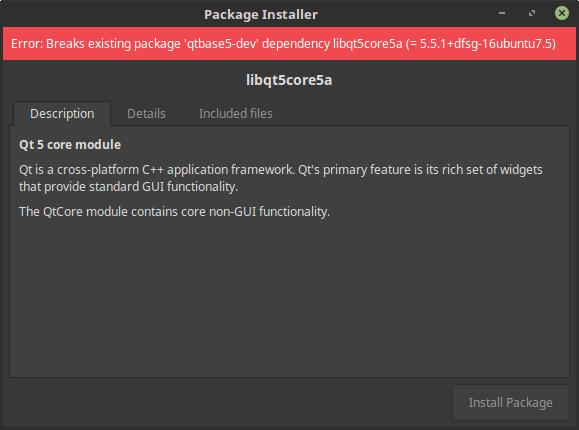 I cannot get libqt5core5a installed because it conflicts with qtbase5-dev. Anyone else run into this problem?